Again i have used a 12 inch template as a focal image while bringing in images from a stamp set by VIVA LAS VEGASTAMPS called PLATE 1450. The wings were taken from a set of stamps that i bought a few years ago [and before the now in place filing system that logs all my stock]. The company i think is ECO GREEN CRAFTS called WINGS [#04307], the stamps were made from recycled rubber. i also got to play with some Tissue Paper from PAPERARTSY and two Stencils from my craft stash. 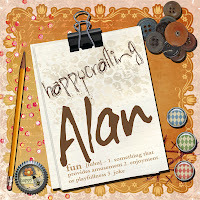 These and almost all the other materials i have used are available from THATS CRAFTY ON LINE STORE. Your One Stop Shop for QUALITY Crafting ITEMS. USED: 12 x 12 inch Blank Canvas. Acrylic Paints - [i have used Vermillion, Cadmium Yellow, Primary Blue. for the base] A basic Red and Green for the Dandelions. For this project i took an old canvas. i had been working on an idea however it just didn't go as i wanted. i have done this to show you that you DONT have to use a new canvas every time you want to and that recycling can be done. Using some Acrylic paints and baby wipes l placed a layer of colour all over the canvas. i think baby wipes are wonderful when it comes to blending and moving colour around a surface. i still kept some of the older project come through as i didn't want to just waste what l had done but incorporate it into the new design. 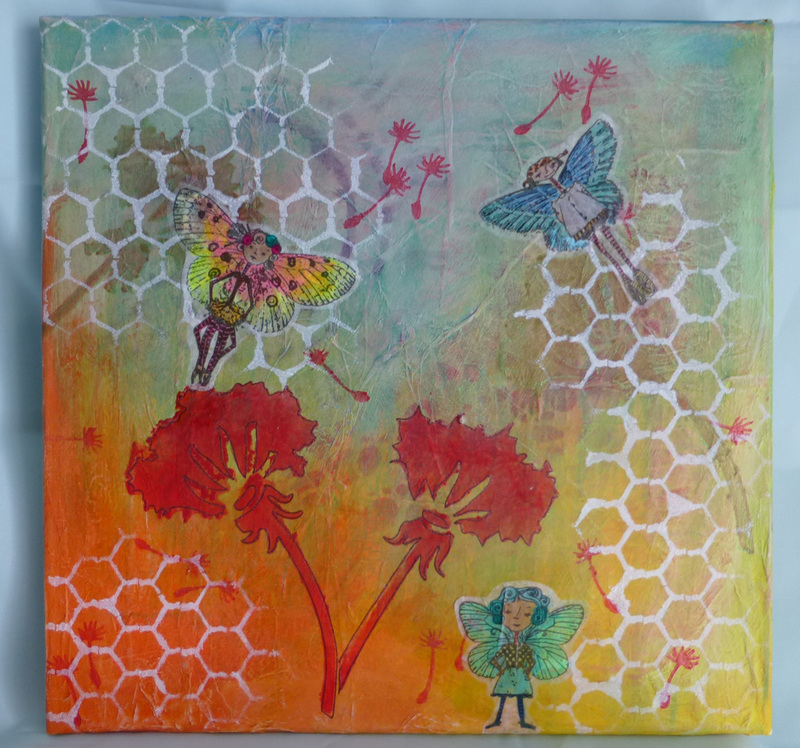 After i had placed the red onto the canvas using the green paint thinned down i wanted to lay some more colour onto the project and not just have the 2 red dandelions and seeds. You can just see one of them near to the circle on the left. Then using a black thin liner i went round the dandelions followed by the red glitter. Highlights using a green glitter pen was also used. The use of Gesso doesn't always have to be to 'Prep' a canvas or project for use. Its a thick medium that can be used as a layer in its own right. it does cover colours that have been used before. The stamps from Las Vegastamps screamed to me that they would fit in perfectly as 'SteamPunk' Fairies. Due to the way that they have been drawn and the images themselves are able to be used with stamps from other sets. So using the tissue paper the body of the fairy was stamped out. Then using the mask that had been made while there was still ink on the stamp and stamped onto a post-it note trying to get as close to the 'sticky' end as possible, then carefully cut out. Using the Aquamarkers i placed colour on the reverse side of the stamped image. One of the Fairies finished using a colour pallet of the same colour hues and ones that are close in hue. The 3 finished fairies. To highlight the wings i used a clear glitter pen just to give some highlights. To secure them onto the canvas i used a matt glue. By doing this i wasn't going to detract from the imagery that had been secured onto the canvas. Really love the fairies! I think the fairies and the dandelions seeds work well together flying around. The re-used canvas worked great! Hi, just a quick note to say what a great canvas and thank you also for any comments you have left on my creations - I do not always have time to reply but thank you again. Wow! Adding the wings was a great idea...I need to use masking more often. I'll also have to look into getting some of the Crackly tissue. Thanks for explaining everything...it really helps! Great canvas!! !